Blog entries to date include an uplifting account by Gennifer Majors, a first-year student. Like Gennifer, I too am finding my way, though in my case as a new Trustee of the Textile Conservation Centre Foundation (TCCF). For over 30 years I’ve worked in Scotland as a conservator, first in private practice and more recently for the National Trust for Scotland. Conservators of all disciplines in Scotland benefit from a supportive professional network and local CPD events, enthusiastically organised by the Scotland Group of Icon (Institute of Conservation), but what’s always been missing is having any recognised training course for the conservation of historic artefacts on ‘our patch’. And then, wham. In 2010, and right here on our collective doorstep, arrives the Centre for Textile Conservation and Technical Art History. 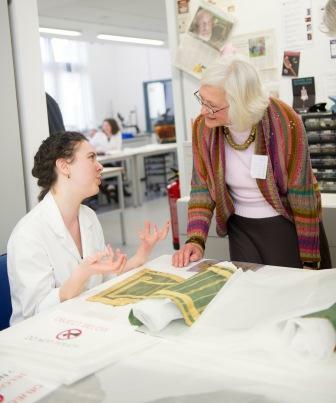 All credit to the University of Glasgow for seizing the opportunity and, together with textile conservation staff old and new, making the transition swift and seamless. The Centre’s arrival has brought such a welcome and exciting new dimension to our wider professional landscape in Scotland. What a fantastic invitation therefore to be asked in April this year to become a trustee of the Textile Conservation Centre Foundation. Although knowing the work of the Textile Conservation Centre, I had however no knowledge of the work of the Foundation. Like Gennifer – bowled over by the course, by Glasgow and by Scotland – I’m bowled over too. But in my case, by the success of the Foundation in raising substantial funds, by the commitment and lively debate of my fellow Trustees, and by the sheer shared pleasure in being part of this amazing venture. The despair, frustration and anxiety borne by Trustees, staff and students just a few short years ago as to how, when and where the Centre might find a new home are now firmly in the past. So I find it a privileged time to become a Trustee and, as Gennifer writes contentedly of her ‘First Impressions’, I too record that mine are off the scale when it comes to positive impressions of staff, students and fellow Trustees, as well as of the Department’s resources and equipment, the two-year MPhil course content and the expanding PhD programme. What’s happened? Well, there was the June Trustees’ meeting in a ‘co-opted’ capacity (prior to being formally appointed). A (non-Trustee) September meeting convened to explore the potential for developing a course on the conservation of modern materials. In October the Foundation’s AGM, which saw my appointment confirmed, was followed by a business meeting – both typically efficient and constructive. But there were also two hugely enjoyable ‘extras’: current 2nd-year student presentations on their summer placements near (the Burrell) and far (the Met, New York). And a memorable evening party hosted by the Foundation’s Chairman, Cindy Chetwode, which brought students, staff and Trustees together in dazzling surroundings. So what next? Trustee meetings are planned 12 months ahead, the next being 5 February. Then there’s the Open Day on 19 March, an 11 June Trustees’ meeting, and then round again to the October AGM and summer placement presentations. A key responsibility is the review of students’ applications for Foundation funding, whether for their first or second years. Awards are made on merit and can be exceptionally generous, the result of the outstanding fundraising campaign led by Nell Hoare (former TCC Director and now Consultant to the Foundation). And I’ve been promised a slot in the Semester 2 timetable to share with students my top tips for tackling application forms for those sought after internships and jobs. Onwards!